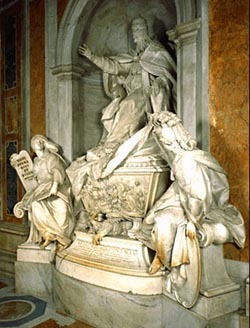 Made by the Milanese sculptor Camillo Rusconi between 1715 and 1723, this monument represents the pope giving his blessing, on top of an urn bearing a relief showing the promulgation of the Gregorian calendar in 1582, when October 4th was followed by October 15th. At the sides there are allegorical statues of Religion, holding the tablets of the Law, and Magnificence; at the base is a dragon, alluding to the heraldic device of the Boncompagni family. Before being elected to the papacy, Gregory XIII (1572-1585) taught jurisprudence at the University of Bologna. An expert in law and theology, he was sent by Pope Pius IV to the Council of Trent. 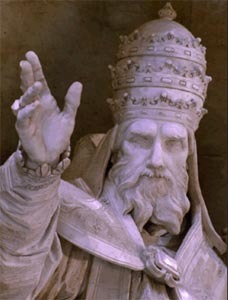 As pope he worked hard to support Catholicism when the new Protestant creeds were spreading through Bavaria and Poland. He had direct contacts with many saints: Carlo Borromeo, Filippo Neri, Ignatius Loyola, and Roberto Bellarmino as well as indirect contacts with Saint Theresa d'Avila and Saint John of the Cross. During his papacy Jesuit missions flourished in India, Japan and Brazil; he can also be considered the founder of the Gregorian University; the great master of polyphony, Pierluigi da Palestrina and the poet Torquato Tasso were his protegés. He also issued the Gregorian Calendar. Eminent scientists and astronomers pointed out that the last calendar reform, by Julius Caesar in 45 B.C. contained some errors, and therefore, over the past sixteen hundred years these errors had grown to 10 days. The correction was made in 1582, October 4th was followed by October 15th. This episode is depicted in the bas-relief carving on the sarcophagus. The pope is shown with famous mathematicians and astronomers including the Jesuit Priest Ignatius Danti, Father Clavius of Bamberg and Antonio Lilio of Calabria, who are well visible because the allegorical figure of Wisdom, with helmet and shield is lifting the drapery to reveal the meeting of scientists presided over by the pope. The figure of the Pontiff may well be the most beautiful in all papal iconography. The monument was carved by Milanese sculptor Camillo Rusconi (1658-1728). The allegorical figures are of Religion and Fortitude. The dragon is a figure from his family's coat of arms. Gregory XIII was Counter-Reformation Pope, he had direct contact with many saints, including Charles Borromeo, Philip Neri, Ignatius Loyola, and indirect contact with St. Teresa of Avila and St. John of the Cross. He gave his name to Gregorian University and Gregorian calendar. The bas-relief commemorates the calendar reform of 1582 in which October 4th was followed by October 15th in order to gain ten days on the calendar that had been instituted by Julius Caesar in 45 AD. That date was chosen so that the Feast of St. Francis - October 4th - would not be missed! In rejection of the "papal" calendar, Orthodox Russia did not institute the Gregorian calendar until the Communist revolution in 1917! Indeed, the so-called "October Revolution" was actually in November. On leaving the Chapel, on the right of the subsequent passage is the Monument to Gregory XIII, built by Camillo Rusconi in 1723, entirely in white marble, in a classicist style influenced more by Algardi than by Bernini in its structural linearity and the expressive peacefulness, enlivened however by the dynamism of the winged dragon of the Boncompagni family which appears to spring out from beneath the sarcophagus. Above it sits the majestic, but not severe, figure of this venerable Pope, flanked by statues of Religion and Wisdom in the guise of Minerva, who raises a drape to show the bas-relief of the sarcophagus. With an animated yet balanced layout, rich in personages, this work by Carlo Mellone illustrates the event for which Pope Gregory XIII is most famous: the reform of the calendar, which is still in use. The monument was commissioned by Cardinal Giacomo Boncompagni to honor his illustrious ancestor. The classical composition of the monument by Camillo Rusconi gives it a schematic configuration; however, the structure of the four main elements, the central convexity of the base, and the two figures emerging on the side give the entire work a strikingly dynamic nature. A trapezoidal urn, sculpted on the front, is positioned between the two figures while a winged dragon by Boncompagni stands out underneath. The figures of Religion and Knowledge are quite convincing (some critics had recognized this figure as Science, with a more specific reference to the Pope's merits). Knowledge is depicted as Minerva, full of movement in its original bold position, precariously balanced between the left arm resting against the shield and the right leg propped on the sarcophagus. The right hand is lifting a piece of clothing, revealing the bas-relief that commemorates the reform of what was called the "Gregorian" calendar. In this bas-relief Carlo Mellone represented the main personages in an analytical manner: the Pope, portrayed next to a celestial globe, the astronomers and mathematicians who surround him, including the Dominican Ignazio Danti (who is given credit for the frescoes of geographic maps in one of the Galleries of the Vatican Palace), the Jesuit of Bamberga Father Clavius, and the Calabrian physician Antonio Lilio, whose brother Luigi was the first to develop the reform project. It consisted in shortening the year 1582 by 10 days, with Oct. 4 being directly followed by Oct. 15, and in eliminating the leap years in the years marking a century. An appropriate reform prepared with scientific methods, but to which only the papal authority could confer universal value. The figure of Knowledge, confirming the general dynamic configuration of the monument, is incisively countered by the figure of Religion, in a more peaceful pose gazing toward the Pope, the left hand resting on a book and the right holding a tablet, bearing the words "NOVI OPERA EIUS ET FIDEM." Died at age 84, probably of a heart attack. Gregory's original tomb, designed by Ciro Ferri and executed by Prospero Antichi, was located where Gregory XIV was to be buried and so was moved in 1591 to another niche in St. Peter's when Gregory XIV died. 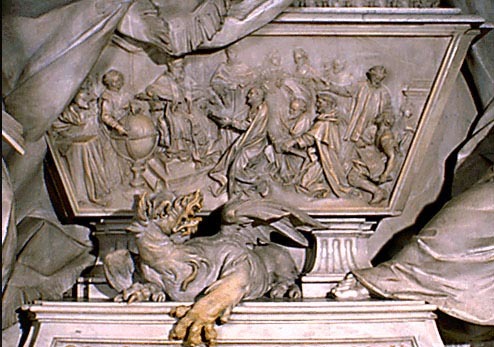 Clement XI (d. 1721) urged Cardinal Buoncompagni (a cousin of Gregory's) to commission a new tomb monument for him. That monument was begun in 1719 and took sculptor Camillo Rusconi four years to complete.